The Xbox Live games are massively important to Microsoft’s long term plan for Windows Phone. They are the reason many gamers buy into the new ecosystem, and the first thing you see when entering the games marketplace on a handset. So, it always makes me wonder just how Microsoft select the games for Xbox Live status. After all, they chose games like Gravity Guy and the lamentable Game Room series over Crazy Horses and Codex, and now this. 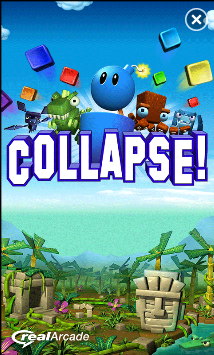 Collapse feels like a micro game expanded into a full title. Playing in an identical fashion to a mini game found in Miriel the Magical Merchant, the developer has added a lot of extras and content to the basic formula and, while this is in many ways admirable, you always get the feeling that you are playing something that can be found for free on the web. The basic aim of the game is to try and clear as many blocks from the screen as possible. Multicoloured blocks rise from the bottom of the screen, and you need to touch groups of three or more like coloured blocks to make them disappear. Once a group has gone, all the remaining blocks are pulled together, allowing a certain amount of forward thinking, and you also get a clue as to what colours are coming by an indicator along the bottom of the games screen. Allow the blocks to reach the top of the screen and it is game over. There are many different conditions for completing a level in the game, but most of the time you just keep plugging away at grouping the blocks. The basic gameplay works, and is responsive and fast, but is never expanded on in any way and soon becomes monotonous. The main ‘Quest’ mode has you travelling across different lands, finishing levels and battling bosses. There is an overworld map to connect it all, but I felt that the map was just there to give the feeling that you are playing through something bigger and more important than you actually are.If you are going to add a map to a puzzle game, either make it interesting or make it beautiful, and this does neither. There are bonus items to be collected, indicated by branching paths, but disappointingly these don’t lead to mini games or new levels, instead you just touch the location and your score is increased. Pointless. The graphics here are deeply average, with generic puzzle characters and backgrounds. The game really looks like a thousand games you could find a web app or Flash gaming site from a few years ago. It all runs smoothly, at least but with such primitive looks it had to. The sound is as you would expect, with decent effects and jaunty music, again nothing inspiring. The game is an Xbox Live title, so there are achievements and online leaderboards to add some much needed incentive to the title, but even this can’t rescue the game from it’s overly simplistic nature, ho-hum presentation and lack of edge. It may seem that I am being overly critical of what is just a puzzle game, but take a look at what companies like 10 Tons are doing in this field- reinventing and expanding upon established ideas with inventive additions and beautiful presentation. 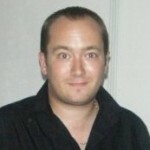 At best extremely average, and at worst a terrible choice for Xbox Live status, this is one to be avoided.